Coworking-Gym : "Here, coworkers go for a set of pull-ups rather than that extra cup of coffee" Coworking-Gym : "Here, coworkers go for a set of pull-ups rather than that extra cup of coffee"
The architecture firm is behind one the more unique coworking space networks in the United States, Arrowstreet, Brooklyn Boulders (BKB), has created a productive environment amongst the climbing walls. Utilizing reuse designs, like a converted warehouse in Sommerville, and expanding their industrial-inspired pallet, the most recent Long Island City location has made it’s home in a luxury residential building. 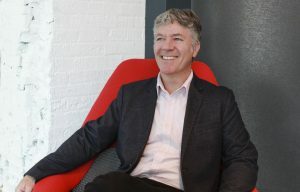 We spoke with Sean Selby, Principal Architect at Arrowstreet, and lead designer on the Brooklyn Boulders project, about the ways in which the “Active Collaborative Workspace” can make us more motivated, and of course, healthier. Hi, Sean. Can you please tell us a bit about your introduction to coworking and the decision to create an “active collaborative workspace”? As many people know, coworking spaces are part of a a phenomenon embraced by a new generation of workers. These are the same that uses city bikes and Uber to get around the city, and stays at an AirBnB when traveling. It’s part of the sharing economy but, more importantly, it’s built on making professional and social connections for new ideas and more productivity. Typically, the physical layout of coworking space includes long tables and desks in an open area, plenty of common areas like kitchens and huddle rooms, and a small number of closed offices. The result is that attorneys, engineers, environmentalists, and even playwrights share the same room. While it might not work in a traditional closed office, it thrives in this environment. I’m interested in it because it creates new possibilities for how we live, work and play. How does a coworking space that focuses on fitness differ from other more traditional spaces in your opinion? While the typical coworking space looks different than traditional office space, it still has all of the components that an office needs: desk space, conference rooms, printing stations kitchens with coffee. The main distinction of a coworking space in a gym is that it’s less sedentary. Taking a break from building spreadsheets and composing meeting agendas in the gym means swinging kettle bells rather than eating cookies. Pull ups instead of more coffee. The core theme is that by exercising the body, the mind responds with more creativity and innovation. What does a day in the life of a Brooklyn Boulders member look like? I’ll give an example. I have a friend who is able to split his time living in two parts of the country. He is a designer, and wherever his laptop is, his “office” follows. While he doesn’t need a traditional office, he does need somewhere to work. 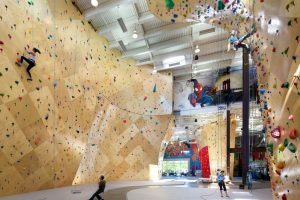 In the six months of the year that he spends in the Boston area, he joins Brooklyn Boulders as a member and utilizes the Active Collaborative Workspace. My friend was first drawn to it because he is an avid climber, but the workspace function allows him to seamlessly mix his work, exercise and play times throughout his normal day. While other BKB patrons may not have as flexible a schedule, the availability of the option to work at the gym can only help to create other avenues for how people do their work and live their lives. Would you say that more active workers are more focused and motivated? There are numerous studies that demonstrate that cultivating a more balanced and physically fit body through exercise, meditation, and mindfulness leads to more creativity and productivity. The activities taking place in the gyms we’ve designed like rock-climbing, yoga, slackline exercises, and parkour place an emphasis on body control, strength, concentration and problem-solving. These physical activities, more than any other fitness routines, build and reinforce the mind synapses that result in healthier brain activity, better memory, and less stress. You have designed various spaces, from personal housing, to shopping centers. What role does design play in creating workspace that is productive and open? Design is absolutely critical to the success of productive workspace. By asking questions and challenging traditional configurations, design activates and exposes the possibilities inherent in the project location, occupant needs, budgets, and available local resources. Note, one-size-fits-all design is short-sighted and doesn’t last, while design thinking can capture the authenticity of a project, and create a special place that people want to come back to, again and again. What are some of the most important things to consider when designing a contemporary workspace? Understanding the context is key. While ideas of openness and collaboration may be important to unrelated workspaces in Phoenix and Minneapolis, users in each may inhabit them at varying levels of privacy and idea sharing. Similarly, a workspace with coworkers serving a single industry, like environmental law and activism for example, would have specific needs a more generalized coworking space could do without. In the example of the coworking space in Brooklyn Boulders, the ambiance of the gym includes a changing assortment of music genres blaring from the overhead speakers, chalk dust in the air, and a dress code that is more sweat suit than business suit. It’s not for everyone, but it certainly works very well for the coworkers who show up every day at the gym to work.